You are at:Home»Articles from Our Contributors»7 Things To Do Before I Go To Rome! 7 Things To Do Before I Go To Rome! I’m going to ROME next month! I’m going to Rome Sept 22-Oct 3, 2014 Pilgrimage as the official Catholic Blogger for St Gemma’s Catholic Pilgrimages! Here are some things I’ve learned as I prepare for my Catholic Pilgrimage. 1. Find a great Catholic Tour company…like St Gemma’s Catholic Pilgrimages. 2. Pray. Prepare to encounter Christ! 3. Consider and invite WHO you would like to travel with. Even though we just celebrated our 20th Anniversary last week, my husband is not able to join me on this trip. We’re hoping that our eldest will be happily settled into first year University and our youngest will be happily adjusted to Kindergarten…but Bill will still have his hands full, juggling work and the kids at home for 12 whole days without me! Thanks in advance to my Mom and my brother…I suspect they’ll be ready to jump in as needed. It is also confirmed that Fr Scott McCaig will indeed be the chaplain for our pilgrimage Sept 22, 2013- Oct 3, 2014! Fr Scott McCaig is the General Superior of the Companions of the Cross…and he’s a close family friend whose vocation we confirmed through his stay with us a week after our first baby was born. 3. Research WHERE you want to visit and PRIORITIZE. I recommend this book that I continue to LOVE: The Pilgrim’s Guide to Rome’s Principal Churches. I am also so happy to have received this book: Rome and the Vatican by Kenneth and Elizabeth Nowell, available through Vero House Publishing. 4. Talk to people who have gone to ROME and glean their highlights and words of caution. I like to talk to Mike and Sue because they have been to Rome so many times and know just what it takes to run a Catholic pilgrimage. I also appreciate talking to Lisa Hendey because she travels so much and documents her travels so well! 5. Consider TIMING re: weather, tourist season, big Feast Days and/events. I’m already thinking about which clothes to pack for versatility (mix and match as much as possible), low maintenance (I’m not great with an iron at the best of times) and modesty (not really an issue with my usual wardrobe, but Mike and Sue remind us that ‘shoulders and knees and everything in between need to be covered’ in all Churches and Sacred Spaces). 6. Brush up on ITALIAN! 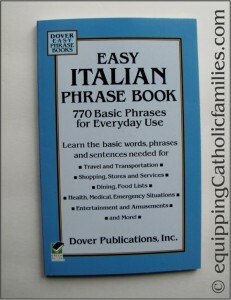 Although Mike and Sue say “…you don’t need to know Italian. A phrase book is helpful, but Italians in Rome often speak English and are very friendly and helpful”, I’d like to learn the basics. Lisa Hendey said pretty much the same thing, learning “a tiny bit of Italian, just to be polite” and recommended DuoLingo. Lisa says it’s free and very fun! 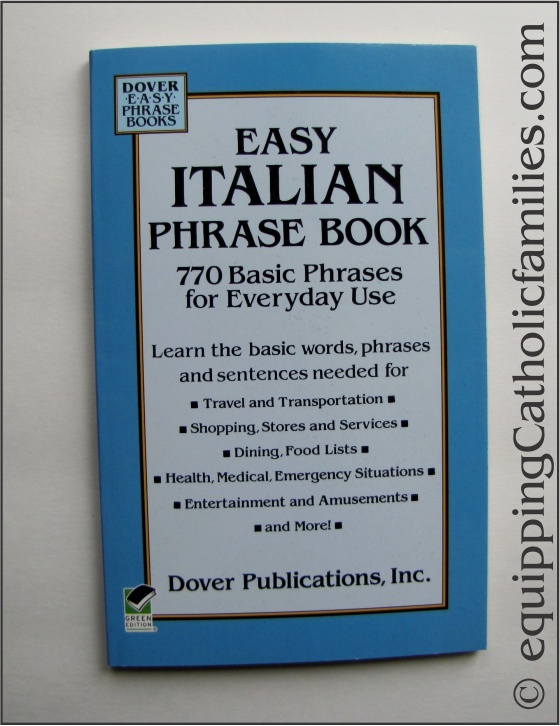 Mike and Sue also recommend Rick Steves’ Italian Phrase Book & Dictionary and I picked up the Easy Italian Phrase Book: 770 Basic Phrases for Everyday Use (Dover Language Guides Italian) . 7. Get my walking shoes on! Mike and Sue say that we don’t have to be in excellent physical condition, but we do need to be able to walk up to a mile at a time on our own. I want to see a lot…so I expect to do a lot of walking! I’ve finally committed to regular exercise again…whether it’s walking, biking or using the elliptical. I’ve been listening to prayerful podcasts/homilies as I walk, helping me with my prayer time and preparing to encounter Christ! I’m going to ROME! Do you want to come too? Check out St Gemma’s Catholic Pilgrimages to check available dates for 2014 and 2015 trips to ROME including the Pope Paul VI Beatification Tour, staying at the House of St Bridget October 16-26, 2014. Fun- my husband and I are going to Rome, Florence and a Mediterranean cruise in October and I can’t wait! Look forward to hearing about your journey! Monica, I remember you mentioned the Rome pilgrimage when we met at the Dynamic Women of Faith Conference. You sounded so excited! Have a wonderful time!